With hundreds of oven mitts on the market these days, it’s quite a task to find the best ones. What cooks are truly looking for is a combination of great fit, gripping ability, heat resistance and ease of cleaning. The good news for shoppers is that there is no reason to stay with old fashioned mitts. Those are famous for poor construction, thin padding, and plenty of burns. Cooks these days have the luxury of modern technology to keep hands safe and comfortable. Some of the best advances have been the addition of silicone to the exterior of high quality mitts. The heat resistance has been improved dramatically, and linings are now more comfortable than ever, due to better construction, premium padding and fabrics. 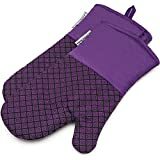 Here are a few great products contending for the spots of the ten top best oven mitts. These non-slip gloves come with a bonus silicone cooking brush. They are constructed with 100% BPA Free silicone, LFGB and FDA approved, and suitable for cooking with food. They resist a range of temperatures from -40 up to 230 degrees. While their padded lining is made from 100% cotton, their exterior features honeycomb-textured silicone. They easily range from work in the freezer to baking, grilling, or even tending to a campfire. These silicone mitts were well received by all customers due to the plush and soft interior of the mitts and their flexibility. Some like the polka dot design and the silicon fingertips on the gloves. 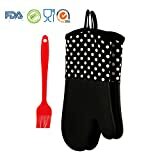 At a generous 14-inches long, these multi-function mitts include BPA Free silicone approved by the FDA for safe cooking with food. 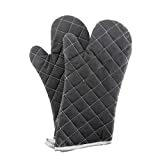 Heat resistant to 450 degrees F. and featuring a comfortable lining made of 100% cotton, the mitts are textured on the exterior with a rugged surface designed for good gripping. This pair is perfect for barbecue grilling and baking. 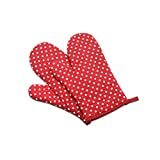 Many customers feel these are the best mitts they have ever used; particularly for those with large hands. The only problem is that they can be slippery when oily. They come with a bonus cooking brush, and they are available in a rainbow of bright colors. 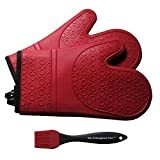 Made to food grade requirements, of commercial grade materials, including BPA Free silicone with soft inner lining, these mitts are some of the longest in their class at 14.7 inches. 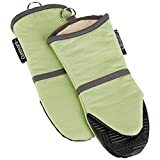 They provide good grip and easy cleaning with a damp cloth. For deep cleaning, they are also completely machine washable. Their heat resistance is very good, with a rating up to 450 degrees Fahrenheit. These are flexible and strong. these mitts are well made, keep hands and arms safe, and are flexible, comfortable and colorful. Made with black silicone, these potholder gloves are made longer for extra protection. The silicone used is FDA approved for safe use with foods. The inner lining is a 50/50 combination of cotton and polyester. The mitts are rated as waterproof and heat resistant up to 482 degrees Fahrenheit. The long 11-inch length helps to protect forearms. Though they are advertised as one size fits all, and customers feel they are very well made, some owners discovered that the fit is not for everyone. Men and women can wear them, and many cooks simply think they are fantastic. The heat resistance of these mitts is up to 500 degrees Fahrenheit. They are designed with water and heatproof silicone grips which are textured to help with handling items securely. They include several layers of thick, premium quality cotton, and are suitable for either hand. They are BPA Free and FDA approved to be safe for handling food. They come with round, silver hooks for hanging while stored. Customers who purchased them like their machine washable feature. What many did not like was their tendency to rip at the seams, which made the inner lining worthless for heat protection. The problem seems to be a lack of consistently good stitching. The mitts may have a smell of burning rubber when used, and better quality may be expected from a product carrying the distinctive name of Cuisinart. 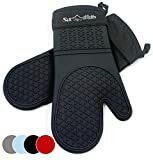 These oven mitts offer extra protection against heat and easy to use fit. The length is good for protecting the wrists at 10.9 inches long. They are made from cotton in a classic shape which works well for either left or right hands. The patterns on the exterior of these mitts provided extra grip. The FDA has approved the seamless silicone design of the outer mitt, while there are extra padded areas to protect the hands and wrists. These will provide protection up to 450 degrees Fahrenheit. The quilted inner liner is made from 100% cotton, and there is extra polyester filling for more insulation. Water and oil proof, they are cleaned by washing them with soap and water right at the kitchen sink. These oven mitts are made to keep hands from burning. Because they are usable for either hand, they are a bit larger, which works well for customers with larger hands, but some with small hands may find that the mitts fall right off. With flame retardant, 100% cotton, these mitts can resist flames for 10 seconds, and once removed from the source of the flames, they will extinguish. One feature which is not as popular is that washing these mitts will reduce the effectiveness of the coating which retards the flames. It is possible to spot clean them, however, and their flexible padding is comfortable. Also nice is their longer length, which helps to protect not only the hands and wrist, but also the lower forearm area. 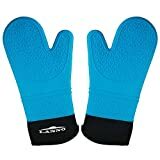 Two features which are very nice about these fanciful gloves is that they are machine washable and can be used by right and left handed cooks. They are made from high quality cotton, in layers, and with insulation to help protect against the heat of cooking. Cooks who own them like the extra wide fit, solid construction, and overall cute design. 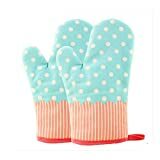 These vibrant colored oven mitts offer premium quality construction and materials which will protect against temperatures up to 480 degrees Fahrenheit. They are designed for safe use at the barbeque grill and the open flame at a fire pit. Made from silicone, they are more versatile than normal kitchen mitts because of their high temperature resistance and non-slip grip. There is a pattern incorporated into the design which supports better grip while holding all sorts of trays, utensils, pots and pans and cooking ware. There are plenty of popular colors including purple, red, white and blue to match personalities and home décor. They feature a hanging loop and are easy to wash with warm, soapy water. The fit, the softness, the padding, and the silicone grippers are all nice qualities. For all home cooks, having professional grade mitts is a huge improvement. These mitts come at great price points, have a high level of heat resistance and feature attractive patterns and colors, too. There is a mitt to fit every hand and every cooking need. Most are easily cleaned after use, and are well-constructed to last for a long time. With so many mitts reaching high standards, the choice really depends on fit and style. A recommendation for anyone considering new mitts is to try two or three of these and see which brand is the best pick. The prices are so reasonable, that it doesn’t hurt to have more than one pair of mitts in a kitchen. Once a fair trial period is done, then add one or two more of the favorite brand, adding colors and patterns which suit the kitchen décor. Extra mitts means extra hands helping…and that’s even better.